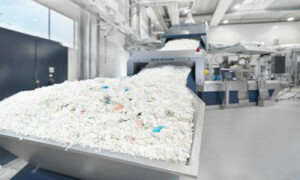 EREMA North America (ENA), Inc, a subsidiary of EREMA Engineering Recycling Maschinen und Anlagen GmbH in Austria, will be exhibiting an INTAREMA 1108 TVEplus recycling line with Laserfilter at NPE 2015. The INTAREMA TVEplus, thanks to the patented configuration of melt filtration with subsequent homogenization UPSTREAM of extruder degassing, plus the efficient Laserfilter, is suitable for the processing of materials with a high degree of contaminants such as wood, paper, aluminum or copper. Interest in the recycling of post-consumer plastic waste is currently growing at a rapid pace in the US, according to EREMA, which is why the company is expanding its US demonstration center to 2,400sqm. The new INTAREMA 1108 TVEplus with Laserfilter to be shown at NPE will be accommodated in the expansion, joining three other existing demonstration lines: an INTAREMA 1108 T and INTAREMA 1108 TVEplus – each with EREMA melt filter SW RTF, plus an INTAREMA 605 K. Construction is expected to start in March and is planned for completion in late summer. Mike Horrocks, ENA CEO, said, “Our North America base represents a major EREMA investment showing a strong commitment to North American customers. The facility is a valuable link to EREMA’s global headquarters in Austria, allowing customers easy access to EREMA equipment, technical support and vast reservoir of knowledge derived from decades of plastics recycling throughout the world. In addition, the enhanced, fully automatic edge trim system INTAREMA 605 K for the in-house recycling sector will also be demonstrated live at NPE 2015. It is designed especially for the recycling of polyethylene (PE) edge trim as a successor model of its previous KAG system. One of the key benefits of the new system is the direct feeding of the endless edge trim via piping and cyclone which takes place automatically and offers high flexibility through possible combinations of cyclone, roller intake or conveyor belt, too. As a result, pre-cutting of the edge trim is not necessary. The fully automatic throughput adjustment to the actual amount of edge trim also reduces labor requirements. This efficiency boost results in high-quality, clean pellets, up to 100% of which can be returned to the production process, explained the company. All INTAREMA systems feature the new Counter Current core technology for improved material intake and higher output capacity, the Smart Start system for extremely easy operation and a top degree of automation plus enhanced ecoSAVE technology for even lower energy costs, added EREMA.